PERIOD OF RECORD.--Discharge records from October 1952 to December 1979, October 1991 to current year. Prior to October 1966, published as "Skunk River below Squaw Creek near Ames". GAGE.--Water-stage recorder. Datum of gage is 857.10 ft above National Geodetic Vertical Datum of 1929. Prior to October 1, 1973, at datum 10.00 ft higher. Prior to October 1991, at site 500 ft upstream. 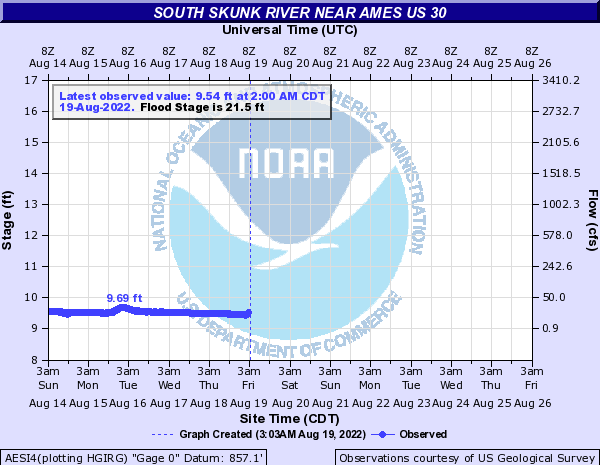 REMARKS.--Low flows affected by pumpage from surficial aquifers by the Ames Water and Pollution Control Department and do not represent the natural flow of the stream.